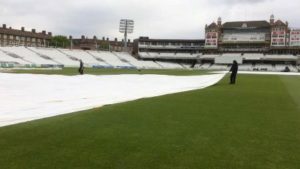 Cricket pitch covers are designed with the end goal of helping ‘get the game on’ – in short, enabling the pitch to remain dry enough for cricket matches to go ahead whatever the weather in the run-up to or during the game. Traditionally fashioned from tarpaulin or oiled cloth, they were heavy, difficult to deploy quickly and compromised the grass plant by not allowing it either to ‘breathe’ or for sunlight to reach it. This meant that their use was limited to a few hours before the game and wet periods during play – when the awkward and heavy nature of old-fashioned covers often hampered their being put out in time to save the day. Over the past couple of decades, however, modern materials and a range of new designs of cricket pitch cover have seen state-of-the-art systems evolve that are at the core of the cricket groundsman’s armoury and are helping clubs from grass roots level to first class save games that would otherwise have to be abandoned. This means that investing in a good cricket pitch cover goes beyond benefiting the pitch – it can help the club decrease the risk of lost revenue due to cancelled fixtures and help engage players; in turn boosting membership morale and recruitment. Modern cricket pitch covers are split into two basic categories – flat sheet ground covers and raised cricket pitch covers. Both of these styles have their pros and cons, and each individual ground will favour a certain style or combination of covers depending upon its geography. Alongside the goal of helping ‘save the day’ when rain interrupts play, the tactical use of ground covers can aid the groundsman in the longer term objectives of keep the pitch dry – and the grass plant alive. By alternating the use of mobile and flat sheet covers, you can control how the pitch dries out through evaporation, transpiration and drainage. Combined with an effective rolling programme this results in a surface that gives the desired hardness – and, in turn, performance. Still the lightest and only truly breathable cricket pitch cover on the market. These attributes, alongside its semi-translucent fabric, mean that it can be left on the pitch for extended periods without compromising plant health or playing surface quality. This proven performer is an outright market leader and can be found in use at Lords, the ECB National Academy, test match grounds, county grounds, local league clubs and schools across the country. For clubs on a budget, this flat sheet cover is hard to beat. 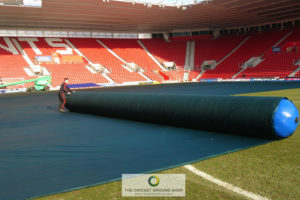 Specifically developed to meet market demand for a high performance, budget cricket pitch cover solution it is made from semi-translucent material that is 100% waterproof – designed to allow light to reach the grass plant and enable photosynthesis. TGC creates a proven germination and propagation environment, increasing the percentage of seed germination and dramatically speeding up the grass plant establishment period. It allows newly seeded areas to be watered whilst creating air circulation and retaining moisture. The total-play team has drawn on its sports surface expertise to develop a range of class-leading pitch protection systems under the ‘Climate Cover’ banner. 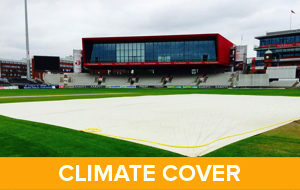 Climate Cover products are used by cricket, rugby football, tennis and golf clubs at all levels across the UK; managing issues ranging from germination and water proofing through to frost protection. Not satisfied with existing products, total-play has challenged long-held assumptions about sports surface covering and has developed a range of proven products – including flat sheets, raised covers, rain covers, growth systems and frost protection covers – as a result. 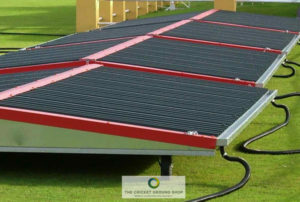 Designed exclusively by total-play’s in-house design team and manufactured by trusted partners using only the finest materials, the Climate Cover range has been designed by the groundsman, for the groundsman; guaranteeing a solution that is fit for purpose as well as being easy to use and handle. The range’s flagship product – the Climate Cover System™ – is the lightest, strongest, breathable ground cover. Setting new standards in its field and proven to provide long-term pitch protection and turf enhancement benefits without compromising plant health or playing surface quality, the Climate Cover System™ is used at Lords, the ECB National Academy, test match grounds, county grounds, local league clubs and schools across the country. The TGC (Total Growth Cover) Frost Protection and Germination System, meanwhile, offers a cost effective, hi-tech pitch cover solution suitable for clubs of all levels requiring frost protection for their natural turf sports surfaces. It acts as an insulation blanket that allows the pitch to breathe; while offering a series of multi-layer configurations that can provide play-ready surfaces down to -6°. It is in use at Premier League football grounds, National Hunt race courses, the Lawn Tennis Association, the IRFU, Copenhagen FC & Harlequins RFC. Whatever the sport or level of play total-play’s highly trained team will work with you to determine the right ground cover solution to suit your immediate, long-term and budgetary requirements. 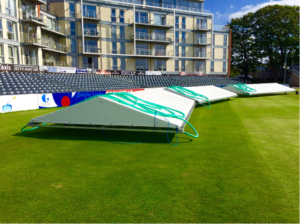 From basic flat sheets to the state-of-the-art Climate Cover System™, the Climate Cover range offers a solution to suit; whether you’re looking for cricket pitch covers, football pitch covers, rugby pitch covers, MUGA, race course covers or tennis court covers.